at Walmart.com - issued by Synchrony Bank's Secure Site. 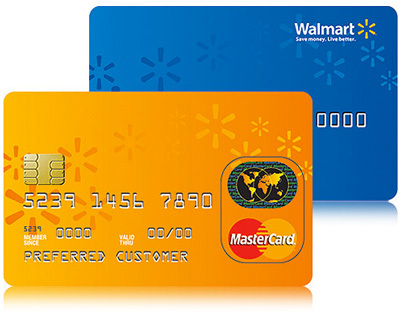 Walmart Credit Card is a great option for anybody who periodically or regularly shops at Walmart. Walmart’s prices are unbeatable, and now you can save even more when you apply and are approved for a Walmart Credit Card. Every purchase that you make at Walmart, will earn 1% back. Your points accumulate until the cash back amount reaches $5. Once you have accumulated at least $5 in rewards, you get a statement credit for that amount. That’s cash back on top of what you save at Walmart already, so you can shop for the items that you need for the lowest prices around, even use a coupon or price match, and still earn cash back. The Walmart Credit Card is even more generous in rewarding consumers with fuel rewards. Every time you fill up and use your Walmart credit card to pay for your gas, you will save 5 cents per gallon at participating Walmart’s In most states, the savings will be automatic ( in Alabama and Florida, you will receive the cash back as a statement credit, similar to the Walmart reward cash back). This card also protects consumers with a 0 liability. You can be confident in knowing that if somebody uses your information to make an unauthorized purchase, you won’t be responsible for it. As a special sign-up bonus, customers will receive a one-time savings of $25 when you spend at least $75 the same day that your account is opened. The Walmart Credit Card also offers a special in-store financing option where you can enjoy 6, 12, 18, or even 24 (depending on the purchase amount) months of free interest. That’s a great perk. The Walmart credit card is for people with a healthy credit score around or above 660. You can also track your credit score online through a complimentary FICO credit score tracker. Anyone who loves to shop for bargains, and wants to save money on all ready incredibly low prices, should consider the Walmart Credit Card. Rewards 1% of purchase amount for every purchase made will be accumulated and issued as statement credit once it reaches $5. Zero Liability. Protection from unauthorized charges. Free FICO® Credit Score. Get your monthly FICO® Credit Score along with the top two reasons codes affecting your score for free.